Apple today released the third beta of iOS 7, which brings a number of improvements and bug fixes to the operating system. According to the release notes, double notifications have been resolved and AirPlay issues have also been fixed. Redesigned Fonts - Fonts across a number of apps appear to have been tweaked to be thicker, using Helvetica Neue Regular instead of Ultra Light. 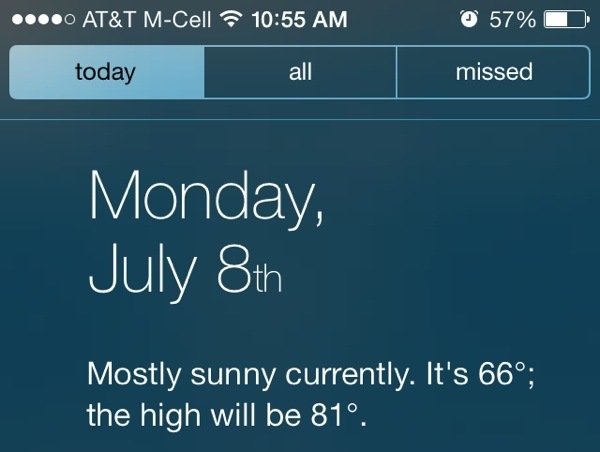 This is most noticeable in the Messages app, where text appears to be bolded, but it can also be seen in the Weather app, the Notification Center, and the Settings menu. Panic co-founder @cabel has provided a GIF that demonstrates the differences. Safari - Safari has had the .com button removed and replaced with a simple period button. The .com, .net, and .org domain extensions can be accessed by holding down on the button. 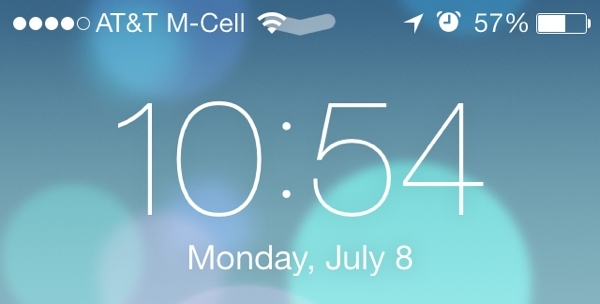 Status Bar - The Status Bar, which provides information on cellular connection strength, Wi-Fi, Bluetooth, and battery life has had its size slightly increased for better readability on the lock screen. 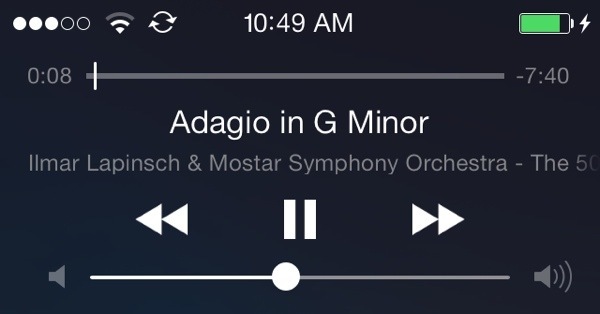 Lock Screen - When playing music, the lock screen will now display the time. Music App - The Music app has seen a slight redesign with new icons and rearranged controls. Ratings have also been re-added. Podcasts - Apple's Podcasts app is now functional. 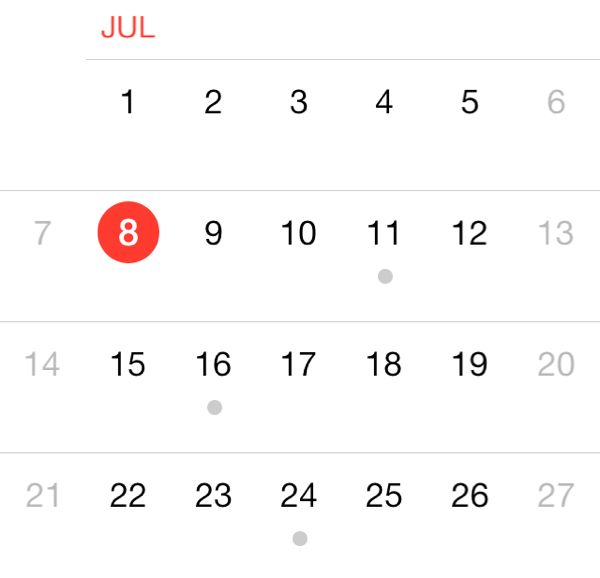 Calendar - In the monthly view, the Calendar app has been updated to display small gray dots on days where events are scheduled. Siri - A number of MacRumors forum members have noted that Siri’s voice now sounds more natural. New App Download Animation - When installing an app, iOS 7 users will see a new animation that does away with download bars in favor of a more organic circular download timer. 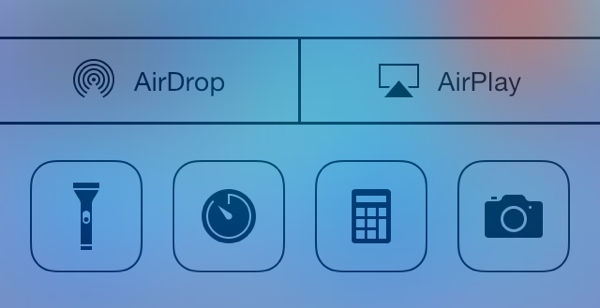 Control Center - The clock located in the Control Center has seen yet another redesign, this time appearing in the original dark format that was removed during beta 2 in favor of a thinly outlined version. Additional features in iOS 7 beta 3 will be added here as they are discovered. Apple is likely to continue pushing regular updates for iOS 7, bringing minor performance boosts and changes ahead of the operating system's public release, which is expected to come in the fall. are the icons still ugly? I have to admit, the layout of IOS 7 does grow on you. Yes, it is a huge departure from IOS 6, but given time, it does look simpler and sleeker. Keeping this up, it will look nice come GM and full release. Glad to see they are blind peoples visiting this site. Glad to see there are illiterate people visiting this site. Have not noticed this on another icon except Twitter yet. I guess this is in addition to numbered tags, but not sure yet. THANK YOU APPLE for removing that damn .com button in Safari right where the space bar used to be. It messed me up every time. Holding dot down to get .com and .org makes a lot of sense to me.